Ronald Fream 1993 18 6722 50 minutes from downtown. A truly challenging golf course and positioned behind many of the greens are large trees and a variety of flora that blooms at different times of the year. 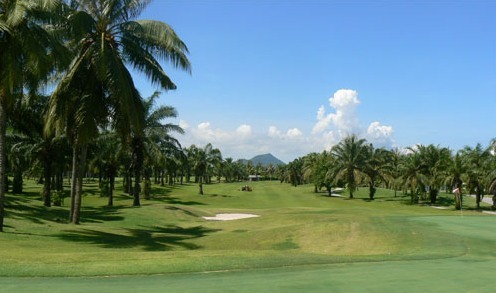 Mountain Shadow golf course has tight fairways and straight driving is very important here. The golf course usually plays longer than it looks, so checking your yardage with the caddy is important. Its fast greens can be terrifying, featuring many multiple slopes and levels and landing your ball at the correct part of the green is essential or you will find yourself in three-putt territory. When the par 3 signature hole, the 17th, is in full bloom, it is visually one of the most stunning holes in all of Thailand, you must carry the tranquil lotus flowered pond which itself is bordered by multicoloured flowering shrubbery to find the deeply bunkered green. Putt well on this golf course and you will know that you have played great golf. Mountain Shadow is an excellent test of golf for both the beginner and professionals alike.